In these formulas, C and other alloying elements represent mass percent. 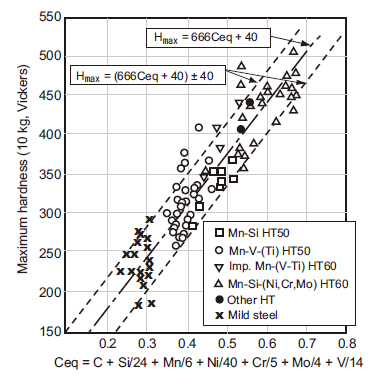 Figure 1: Maximum HAZ hardness vs. Ceq of 20-mm thick mild steel and high tensile strength steels (Bead-on-plate welding with a D5016 electrode) [Ref. 1]. As shown in Figure 1 the maximum HAZ hardness increases as the Ceq increases, illustrating the profound and direct effect that carbon has on hardness. Other alloying elements also affect hardness, but with less influence. In total, they affect the hardenability of the weld. 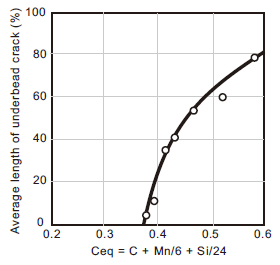 As indicated in the figure, the maximum HAZ hardness of a carbon or low alloy steel can be estimated as per the formula Hmax = (666Ceq + 40) ± 40. However, the most important use of this concept has been not to predict hardness, but the minimum preheat temperature needed to avoid the formation of hard martensite or a microstructure with poor ductility. Such a microstructure, in conjunction with weld joint restraint and weld metal hydrogen content, can cause cold cracking of the weld. As shown in Figure 2, underbead cracking, a type of cold cracking occurring in the HAZ, increases with an increase in Ceq. For the reasons discussed, Ceq is an indicator that can help predict the hardenability or weldability of the base metal. That is, the higher the Ceq, the greater the expected hardness and the higher the preheat temperature. This is why Ceq may be included in material specifications and welding construction codes as either a recommended or mandatory guide for regulating steel selection or for controlling welding procedures. H.Suzuki and H.Tamura. Welding Metallurgy. Complete Book of Welding-Series 1, Sanpo Publications Inc.
 S.Yamamoto. The ABC’s of Arc Welding and Inspection. Shinko Welding Service Co., Ltd.